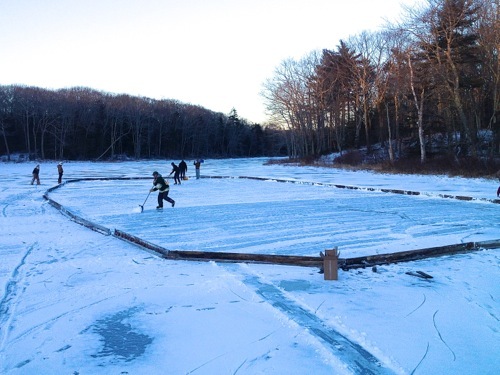 Every winter The Carpenter’s Boat Shop sets up a hockey rink on a small pond in New Harbor. Built with 2x6s screwed into a 2×4 base, the height of the rink is just enough to keep the puck in and the snow out. Still, it’s a lot of work trying to maintain an outdoor rink all winter. 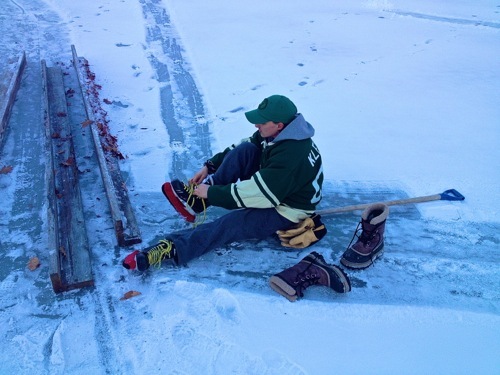 At the end of every snowstorm we put on our skates and shovel the ice with the same care and precision we use to build boats. At the start of each game, everyone throws their sticks in the middle of the rink to be divided randomly so it’s never awkward choosing teams and the teams are always different. The rules are simple: no lifting the puck, no hurting, no name calling, and every game always ends with a tie. We don’t play to win and we always try to encourage passing more then scoring. After work, even when it’s getting dark, we grab the LED light-up puck and head down to skate before suppertime. Reg Reilly’s house overlooks the pond and has two big flood lights he turns on with the first slap of the puck against the boards. He loves hockey just as much as we do, and even at 85, he’ll still come down to play a game or two. One Saturday afternoon he, his son, grandson, and great grandson joined us on the ice. What an incredible experience it was to skate with four generations, all of us enjoying a game as timeless as the love and happiness it creates.